Increasing self-sufficiency through educational and charitable projects for people nationally and internationally. After several years of trying, finally it will happen. With a rented van, traveling companions and our Baobab Bag finisher, we are off to the ladies who harvest, prepare and weave Baobab bags. Traveling the first day on what we once thought were rough roads, potholes and speed bump ridden wide dirt roads, our journey began. What we didn’t know was that the next day we would learn what “rough road” really means. The map showed our route on a secondary and tertiary road. As we began driving the dusty secondary road, baobab trees appeared. Huge, towering, and spreading with a trunk that would take a dozen people to stretch hands around, the baobab commands attention. Climbing pins, barely visible in the folded and scarred trunk provide access to the multiple beehives hung in the massive limbs. Moving on, the herds boys, cows, goats, sheep and donkeys common to most of Kenya stroll the road and roadsides, as few vehicles travel here. Every small fork in the road finds us asking, “Where is Tsheikuru?” Why is the way they choose always the,” One less traveled by?” But off we go. Now driving becomes an act of dodging rocks, ruts at least 2 feet deep and passing through the dry ditch where there once was a culvert, long since washed down with the seasonal torrent. Huge volcanic peaks rise creating a beautiful driving distraction. The passengers become a bit nervous as the road drops sharply and curves around the mountainside. No guardrail on this small one lane road. As the vehicle moves slowly through small villages and past traditional homesteads, work stops to watch as the vehicle slowly picks its way through the rocks, holes and ditches, two wheels on the road, two wheels on the bushy angled roadside. That was the end of the secondary road. Now we find the tertiary road. Scraping the sides of the van on the acacia, occasionally hitting the errant rock as we straddle a ditch deep enough to hide a large dog, we slowly make progress. “Are we there yet?” Not yet, as we approach a broad river bed with just a trickle in the middle. There are the remains of a double lane bridge high off the riverbed. The pieces of the bridge that remain hint at the glorious celebration when the bridge was new. But now only piles of stone show a long forgotten attempt at repair. In the riverbed the cows slowly meander searching for a deep enough pool to drink. No way I can maneuver the rocks, the riverbed and the long climb up the other side. But maneuver I must. We have come too far now to quit. 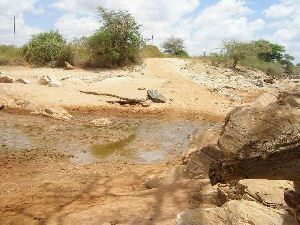 Walk the course, identify immovable rocks, and mud holes. Move the moveable, eye measure the ditches and then trust. Slowly, ever so slowly straddle the ditch but don’t slip, a little left, a little right into the riverbed. Search for enough traction to spin up the other side. WOW! Wonderful!! Oops, A shiver of fear, I have to go back later. Now picking the way through the rocky, ditches seems easy. A little later, not another river!! This one is impossible, impassable. Have we come so far only to turn back? No, park the van and walk. Down the bank, a hot, very hot, sandy riverbed burned holes through the soles of shoes. Relentless sun beating unmercilessly, I am truly glad I bothered to bring my hat. Does this river really fill up in the rains? The river’s banks loudly answer that question, as tall acacias lie tumbled into the river, more tell the story with their exposed roots. Eventually our guide leads us up out of the searing riverbed onto a winding path. The path leads to a small mud hut in the bush. 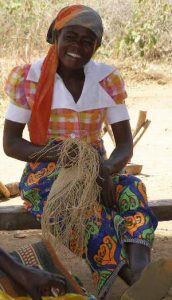 There, outside sitting on chairs, stumps and ground cloths are several Kamba ladies calmly chewing, making cordage and weaving. We have arrived!! Taking our seats, the ladies begin to serve us warm soda and beans with rice, and show us how the process from Baobab tree to beautiful basket occurs. First the bark is cut from the tree in large rectangles. It is carried back to the shade at home where small strips are peeled off the tough exterior bark. The bark is then chewed. At first it is as dry as the dust, absorbing every drop of saliva. 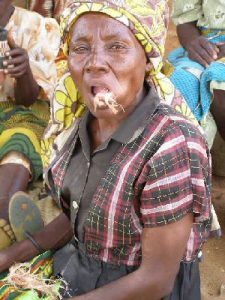 Persevering through dry mouth, the saliva begins to respond and soon the hard dry bark is dripping and separating into fibers. Next the fibers are pulled and lengthened to prepare for the cordage process. Holding the fibers tightly in one hand against the flat of the thigh, the fibers are rolled against each other to form a thin firm thread. Fibers are added to the end to be twisted in until long strips of cordage are rolled into balls. Often the cream colored fibers are dyed with soot from the fire, roots, barks or berries. Once enough Baobab bark has been prepared the weaving begins. The bags are woven in several ways but most often using a spiral weave. Finally after about 5 weeks, the bags are finished off and our order will be ready. 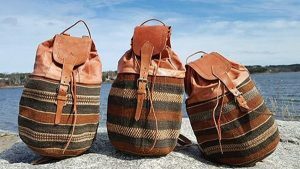 You can find these bags at the Aina Moja Shop in Belfast, Maine or on line at www.ainamoja.com. But the ladies will not let us leave quite yet. A song begins to roll, one of the women stands to dance. Such great laughter as we try to learn the hip thrusting, leg throwing dance of the Kamba. Time is fleeting and we must leave. A bit more dehydrated, the long walk back to the van was slow and laborious. Never were we so glad to see the dusty vehicle and its cargo of bottled water. The story goes on with more adventures in the bush. More stories will come but why not plan to travel with us for your own adventure in Africa? For more information call 1-888-760-7943, email info@expandingopportunities.org, or visit the website at http://www.exop.org/. Copyright © 2019 Expanding Opportunities. Proudly powered by WordPress. Silverclean design by Iceable Themes.